Use this answer key with the Wampanoag Thanksgiving worksheet. 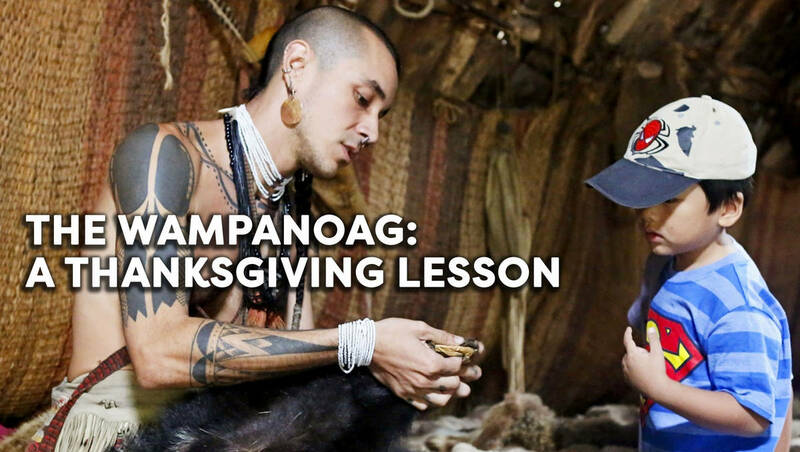 This lesson teaches students about the Wampanoag people, who play an integral role in the history of the Thanksgiving holiday. 1) What does the name "Wampanoag" mean? 2) Where did the Wampanoag live during winter? 3) Where did the Wampanoag live during the summer, spring, and fall? 4) To the Wampanoag, is Thanksgiving just one day? No, Native People celebrated many different days of thanksgiving, including, for example, a "Strawberry Thanksgiving" and a "Green Corn Thanksgiving." 5) How many days did the harvest festival of 1621, known to us as the first Thanksgiving, last? 6) How many Native People attended the harvest festival of 1621? 7) What animal did the Wampanoag use to fertilize the land? 8) How were the Wampanoags able to have enough food during the winter months? 9) What percentage of the Wampanoag diet was meat? 10) Name the four ways the Wampanoag gathered food. 11) Name two foods the Wampanoag ate that you’ve never eaten. 12) Name two foods the Wompanoag ate that you have eaten. Answers may include eggs, nuts, berries, greens, mushrooms, corn, beans, squash, melon, deer, rabbit, shellfish, and fish. 13) What does Thanksgiving mean to you? 14) In the 1600s, everyone ate according to the season. Do you have a seasonal diet? If not, why? 15) If you could invent another national holiday to accompany the harvesting or growing of food, when would it occur and what would it be? For example, you might celebrate planting seeds in the spring.